One thing I love about Six Sisters' Stuff recipes, is that they use common ingredients that you will have around the house. If you need to pick up something for a recipe, it is typically just one item that you can easily get at the grocery store. The 12 Christmas Cookies all look wonderful, and they aren't complex to make at all. A few are a spin off of a traditional cookie, say Chocolate Chip or Butter cookie, with a nice addition to them. We will be making several before Christmas! I loved the Family Traditions section and we actually do several of the suggestions already like having a Christmas Book Advent, where we wrap a picture book for each day of December and read one each day as a count down until Christmas. 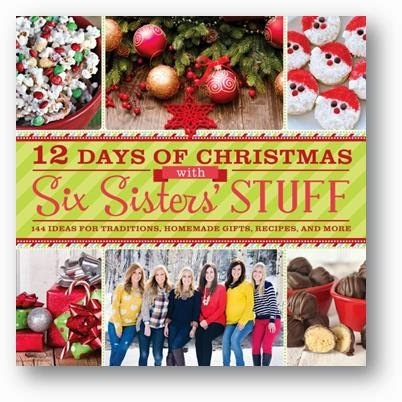 The book is really focused on family and giving and that is truly the spirit of Christmas! They have captured so many fun, easy things to do as a family to make the season bright. of 12 Days of Christmas!! The Giveaway is listed on all participating tour blogs.